Back in early May, Quirky and GE announced a contest that had users pitching ideas for everyday objects that could be improved by adding software to the mix. The eventual winner was — surprisingly enough — a smart milk jug that could tell users when their milk was going bad as well as when to buy some more. 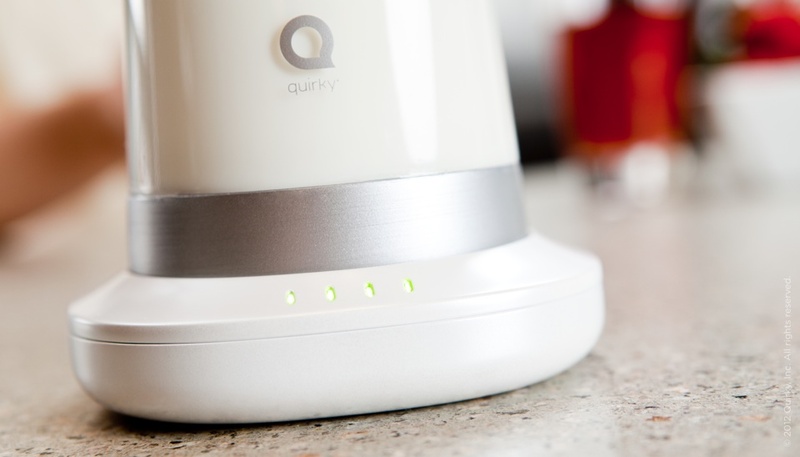 It may not have been the sort of project that most of us had expected, but Quirky has given TechCrunch the first glimpse at what they managed to come up with: the Milkmaid. And here’s the kicker — it’s gorgeous. Here’s how the Milkmaid works. 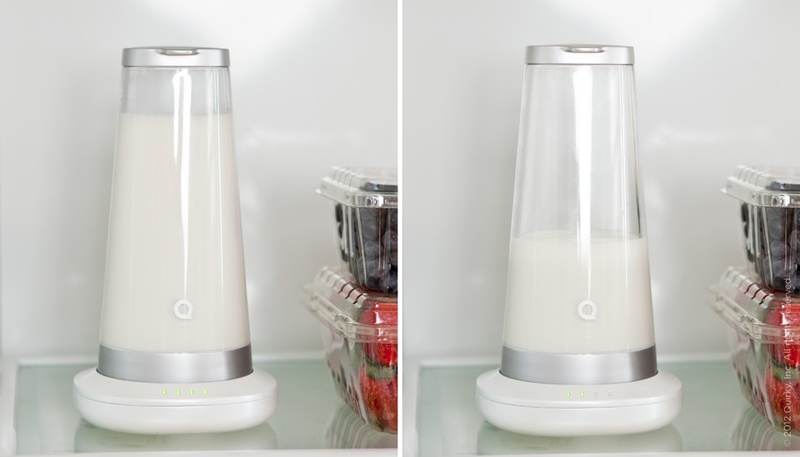 The milk goes into the vessel (in its current form, it can hold up to a quart of milk), and as it begins to turn sour in the fridge, a set of pH and temperature sensors located in the vessel’s metal base will periodically take readings and relay that information to the pedestal that the vessel sits in. That white pedestal — they call it the SmartBase — is where most of the magic happens. When a microcontroller in the base receives the information from those pH sensors, it slowly changes an LED mounted on its front from green to orange to signify how nasty the milk is getting. Also nestled inside the SmartBase is a weight sensor meant to detect how much milk is left in the vessel, along with a GSM radio module, an antenna, a SIM card, and a hefty rechargeable battery to keep the whole thing humming along. Once the weight dips below a certain threshold, or when the pH dips to a point where the milk has gone bad, the base will send a text message to a user’s phone to remind them to buy some more. 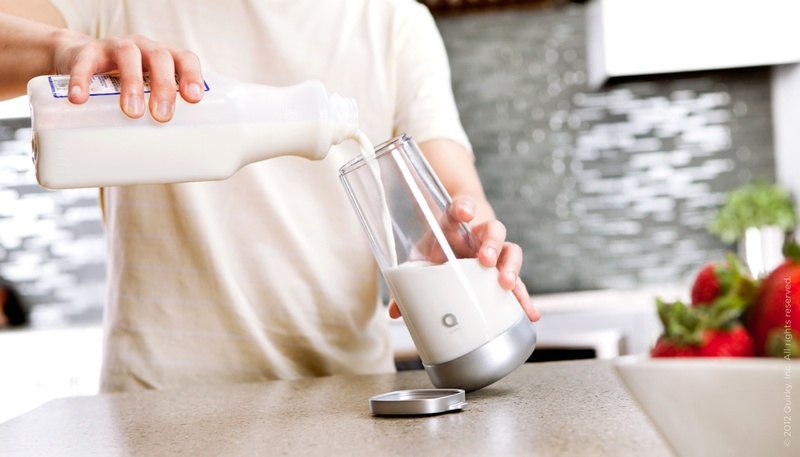 To round out this package is a not-yet-final app that connects wirelessly to the Milkmaid to deliver on-demand stats about your milk — think temperature, expiration date, and how much milk is left in the vessel. 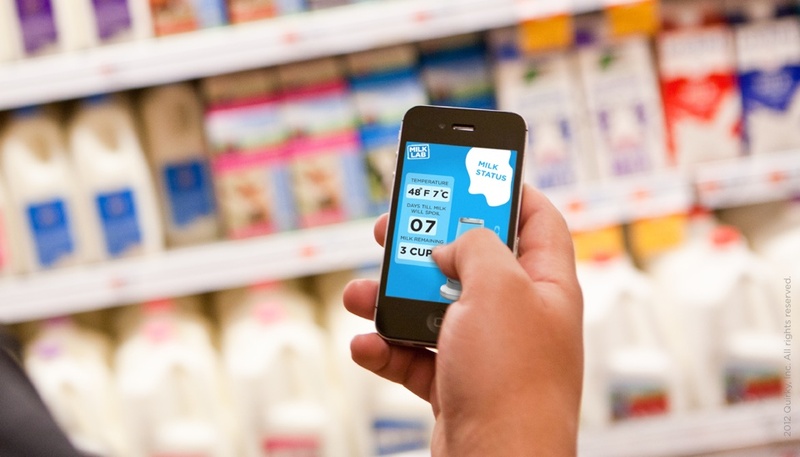 The app also includes recipes for both regular and spoiled milk (I didn’t know those existed), as well as the ability to re-order milk from app-friendly grocery delivery services if schlepping down to the supermarket isn’t your thing. If I drank milk, I’d be all over this. Though plenty of crafting and design went down when the Quirky team set up shop at the San Francisco Maker Faire, they had their share of help from their community too. Quirky design team member Jess Fugler noted to me that the while the Milkmaid’s industrial design was mostly handled by their team, the ideas of having the Milkmaid sending text messages and putting the “brain” in a separate base came from fans of the project. For those unfamiliar with Quirky’s M.O., they’ve just wrapped up design and engineering phase by completing the working prototype. With that complete, now their focus now turns to determining whether or not people would actually buy the thing, which also involves getting Quirky users to share how much they would pay for a mass-produced Milkmaid. With any luck the Milkmaid the will soon become a real product with a non-obscene price tag, if only because it would open the door for new and more ambitious crowdsourced products to come.